Texas Freckles: Fun with the Go! Baby! I'm sure you've seen a few of these new Go! Baby cutters around blogland lately. I was so excited when I was presented with the oppourtunity to try one out and show it to you. As someone who has been in the emergency room having seven stitches to re-attach the side of my left pointer finger after cutting all the way to the bone with a rotary cutter, the Go! Baby seemed like a great fit for me. 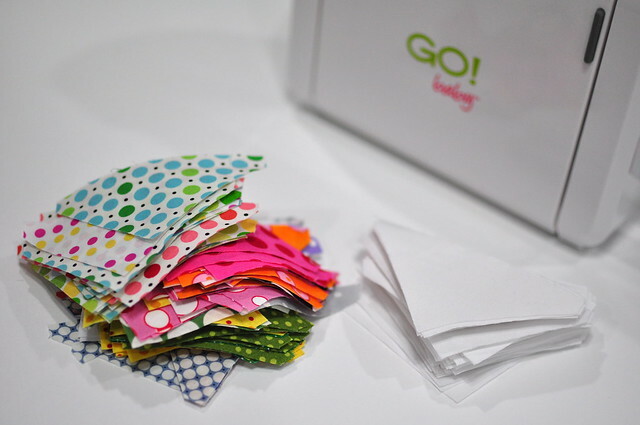 I was also excited because I teach kids to sew and I think this would be a really fun (and safe) product for them to use. Accuquilt let me choose three dies, and I chose the Value Die, the Quarter Square 4" Finished Triangle, and the Half Square 4" Finished Triangle. My favorite die so far is the quarter square triangle. It cuts eight triangles at once, but the best part is that they fit together perfectly making it simple to get perfect points. I have never made HSTs or QSTs that fit together this nicely. 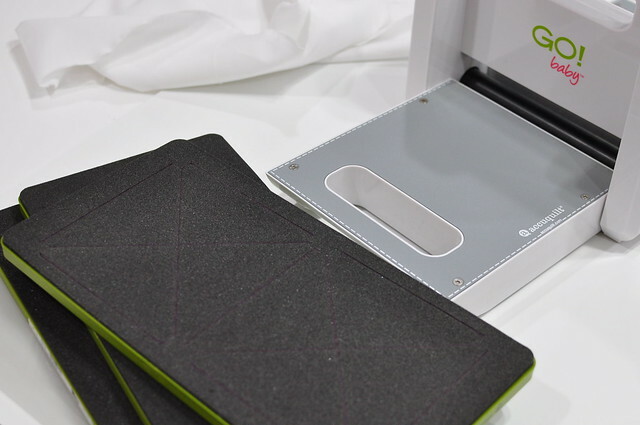 The corners of the triangles are dog-eared, so that when finish sewing your four pieces together, there's nothing to trim! Using the Go! Baby is easy and it's really portable. I took it to a Saturday Sew with the Dallas Modern Quilt Guild on Saturday and it fit easily in my bag and wasn't too heavy. When it's folded closed, it looks really cute on the shelf too! I've been cutting lots of Kona white triangles and bright dots to make a quilt for my cousin's daughter. I'm going with a totally random layout and I'm loving the way it's coming together. I'll show you more as soon as I get the blocks together. The way the points line up is amazing! I wanted to share this link with you too. 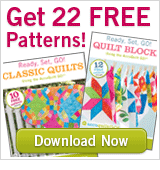 Head over to Accquilt and sign up to receive 22 free patterns! I downloaded the patterns and there are some really cute ones in there. You get one set of quilt patterns and the other is a collection of quilt blocks. I really want some more dies for my Go! Baby now. I'l drooling over the Tumbler and the Drunkard's Path. 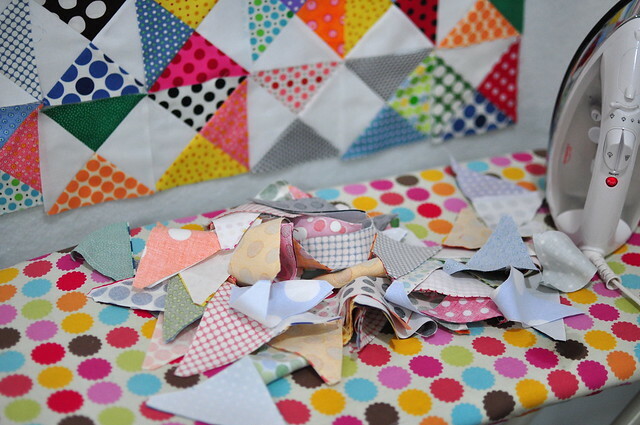 So, stay tuned for more of the quarter square triangle quilt and some exciting news for one of my sweet blog readers! Aren't these the greatest machines. I've had my fair share of rotary accidents. I just gave one away on my blog and it was so much fun making projects and using it. Ohh I have been wanting to try one of these! I'm expecting my 3 child and I was thinking about the tumbler dye for the "new" addition! Can't wait to see what your quilt looks like! I was just notified last week that I won a GO! Baby. I've been agonizing over what dies to select, and LOL, I had decided yesterday to get the exact three you got. I was also considering the Tumbler, Drunkards Path, basaket, circles and hexies. But I figured the squares and triangles would be used in more quilts than any of those others. I haven't submitted my order yet. I'm still bumfuzzled about what I want to do. But it did my heart good to see your post. 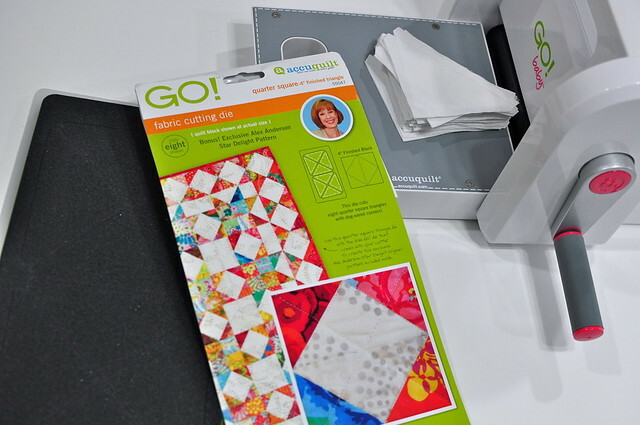 I have a feeling I'll be watching a lot of Accuquilt videos now. ooh, lucky you! looks like that quilt is coming together so quickly and neatly... not that your quilts were anything different before i mean! I can't even imagine points that match up. Ha! I love that it is so portable too! What a fun toy! I love your happy ironing board cover. Just checking up on you...I know you haven't posted since this one, and was wondering if all was okay? I've missed you!